Hampers are always a unique gift idea. You can fill it with their favourite sweets/chocolate from the supermarket, retro sweets or American candy we can't usually get our hands on. The best thing is that you don't have to stick to a store bought one and can really personalise it depending on who you're buying for. Who doesn't love food right?! A cheesy christmas jumper is a MUST in my opinion and this year, the high street has gone a little crazy and I've seen such an interesting array (the guy who was walking around the German Market with a light up snowman one, high five!). This one from River Island isn't too crazy that it couldn't be worn throughout the other winter months. ASOS has a great range of Christmas Jumpers at the moment. 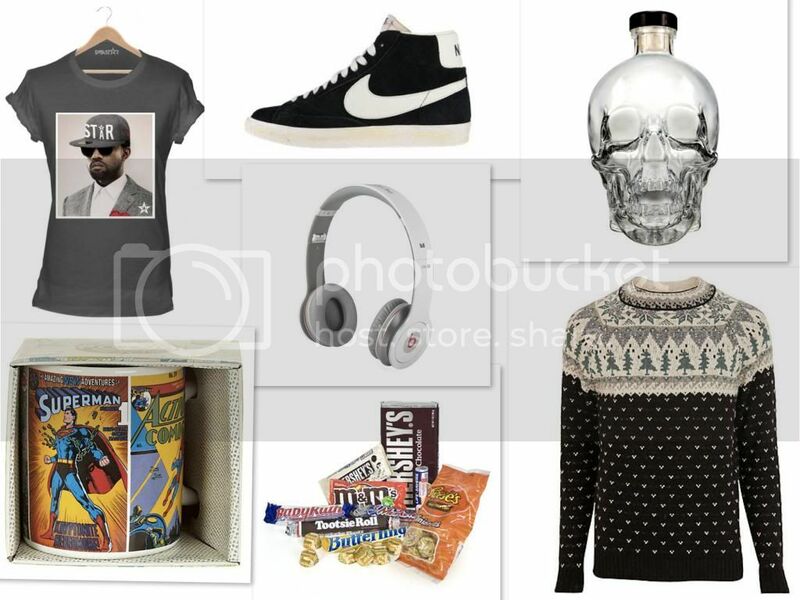 Whilst the Nike Blazers and Dre Beats are slightly cliché they do make great gifts that'll last and the Crystal Skull Vodka is really unusual and makes a welcome change to the standard bottles of alcohol everyone receives at Christmas. What are you buying the guys in your life this Christmas?